Product #5695 | SKU BEPP400 | 5.0 (based on 3 ratings) Thanks for your rating! In the age of the MP3, it can be easy to forget that a turntable signal needs a little help before it reaches a mixer or home stereo if it's going to be heard. Thanks to the PP400 phono preamp, your turntable will get the boost it needs to bring your vinyl to life. 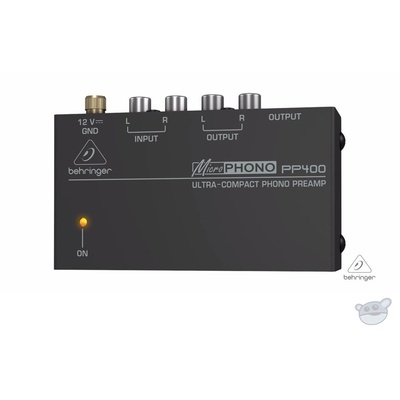 This is one of the cheapest phono preamps I could find in NZ, but in terms of quality it is anything but cheap. I use this preamp with my Pro-Ject Debut Carbon turntable, and the sound is (to my ears anyway), fantastic. Whilst I imagine you would get better sound out of a $300 preamp, for most users (and a lot of turntables), the difference wouldn't be particularly noticeable. It suits my needs (and budget) perfectly, and has got to be the best bang for your buck in it's price bracket.